Stiffness in the big toe joint is usually related to some form of arthritis. Read on to find out why this happens and what can be done about it! A common location for problems in the foot is the big toe joint. There are many people who regard pain in this area as a bunion, though there are actually many different conditions that can cause pain here. One such condition is called hallux limitus, which literally means limited motion of the big toe (hallux). This condition affects people differently, but the general symptoms are stiffness or limited motion and - often times - people can also notice a bump on the top and/or side of the big toe joint. Hallux limitus is essentially degenerative joint disease or arthritis of the big toe joint. There are a few reasons that this condition occurs. As with MANY conditions in the foot, there are foot types which predispose a person to problems with the big toe joint. The bones in the ball of the foot should create a parabola which allows even distribution across the big joints behind each and every toe. There are some people who have more of a stepdown appearance across the forefoot (seen on x-ray) and this predisposes the big toe joint to increased pressure and wear and tear over time. The joint will essentially jam because it does not have room to move. Simple x-rays at the doctor's office can easily demonstrate this condition which we usually refer to as a "elongated first metatarsal." Another type of foot that can predispose a person to jamming and stiffness in the big toe joint is a condition called metatarsus primus elevatus. This is when the 1st metatarsal is raised higher than the adjacent metatarsals. Because the metatarsal is raised in this condition, every time the great toe tries to extend it bumps into the metatarsal bone. Over time, a spur can develop on the bone and further limit motion and also cause pain due to pressure in shoes. Metatarsus primus elevatus can be flexible or somewhat rigid. If feet that are more supple, a simple modification in a custom orthotic drops the metatarsal bone down and this enhances the motion in the joint, decreasing stiffness. In more rigid feet that are unable to adapt with an orthotic, there are surgical procedures to lower the metatarsal and enhance and restore range of motion. 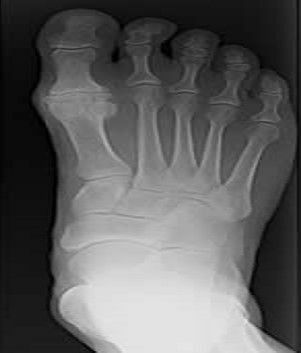 In some patients, the elevation of the 1st metatarsal bone is more a reflection of a very flexible foot in which the arch collapses while walking. This can cause elevation of the metatarsal because the head of the bone contacts the ground and is then forced upwards because the arch is not supported. Another common cause of hallux limitus is a traumatic injury to the great toe joint. Whether a one-time incident (like stubbing the toe) or repeated jamming due to sport (turf toe, etc), trauma damages the cartilage in the great toe joint and it can eventually wear down. Once the cartilage in the joint has worn down to a certain degree the raw bone on one side of the joint rubs on the raw bone of the other side of the joint and causes pain. A joint can actually fuse in some instances because the cartilage is no longer there to act as a barrier between the two bones. Pain in the big toe joint can lead to a lot of pain and trouble walking. A quick visit to your local podiatrist can identify the cause of pain and help to alleviate the pain and decrease further damage to the injured area. Make an appointment today with Prairie Path Foot & Ankle Clinic to start improving your function and decrease your pain!